Thanks to "gmbertani" for letting us know about his recently released RTL-SDR compatible software called "Echoes". Echoes is a Windows, Linux and Raspberry Pi/Arch compatible tool that can be used together with an RTL-SDR and appropriate antenna to monitor for meteor scatter detections. Meteor scatter works by receiving a distant but powerful transmitter via signal reflections off the trails of ionized air that meteors leave behind when they enter the atmosphere. Normally the transmitter would be too far away to receive, but if its able to bounce off the ionized trail in the sky it can reach far over the horizon to your receiver. Typically powerful broadcast FM radio stations, analog TV, and radar signals at around 140 MHz are used. By listening to these signal blips it can be possible to estimate the number of meteors falling. 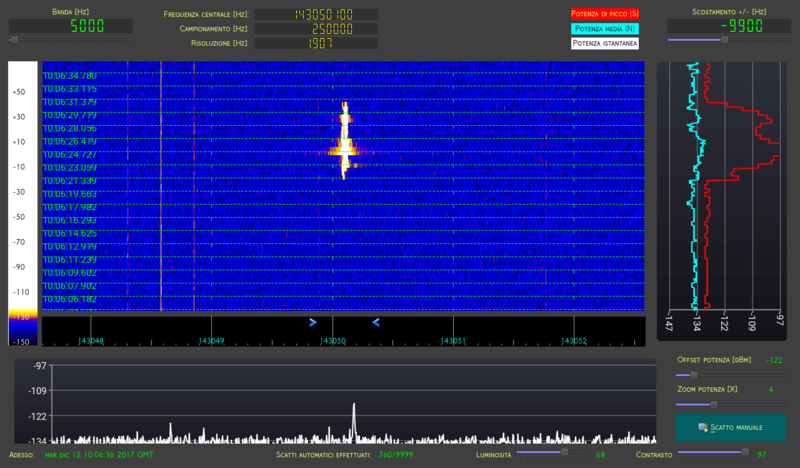 Echoes it's a radio spectral analysis software for RTL-SDR devices, designed for meteor scattering purposes. Echoes doesn't demodulate neither decode any human-made signal. Its main goal is to analyze and record the total power of natural signals and generate screenshots and tabular data (CSV, GNUplot) output in presence of particular peaks in a selected narrow range of frequencies. Since there is no demodulation, there is no provision for audio listening, except for a notify sound when an event has been recorded. Captures waterfall spectra as PNG screenshots and statistics data files. 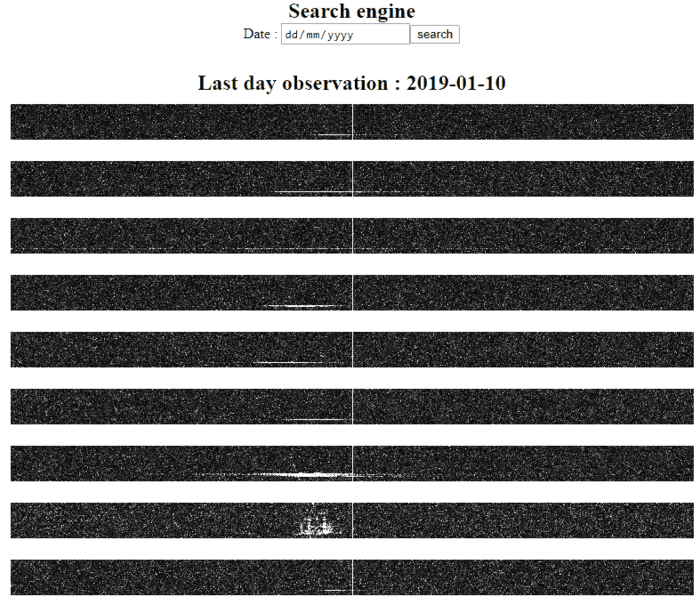 Over on his blog Dave Venne has been documenting his attempts at using National Weather Service (NWS) broadcasts for forward scatter meteor detection with an RTL-SDR. Forward scatter meteor detection is a passive method for detecting meteors as they enter the atmosphere. When a meteor enters the atmosphere it leaves behind a trail of highly RF reflective ionized air. This ionized air can reflect far away signals from strong transmitters directly into your receiving antenna, thus detecting a meteor. Typically signals from analog TV and broadcast FM stations are preferred as they are near the optimal frequency for reflection of the ionized trails. However, Dave lives in an area where the broadcast FM spectrum is completely saturated with signals, leaving no empty frequencies to detect meteors. Instead Dave decided to try and use NWS signals at 160 MHz. In the USA there are seven frequencies for NWS and they are physically spaced out so that normally only one transmitter can be heard. Thus tuning to a far away station should produce nothing but static unless a meteor is reflecting its signal. Dave however does note that the 160 MHz frequency is less than optimal for detection and you can expect about 14 dB less reflected signal from meteors. So far Dave has been able to detect several ‘blips’ with his cross-dipole antenna, RTL-SDR and SDR#. He also uses the Chronolapse freeware software to perform timelapse screenshots of the SDR# waterfall, so that the waterfall can be reviewed later. Unfortunately, most of the blips appear to have been aircraft as they seem to coincide with local air activity, and exhibit a Doppler shift characteristic that is typical of aircraft. He notes that the idea may still work for others who do not live near an airport. 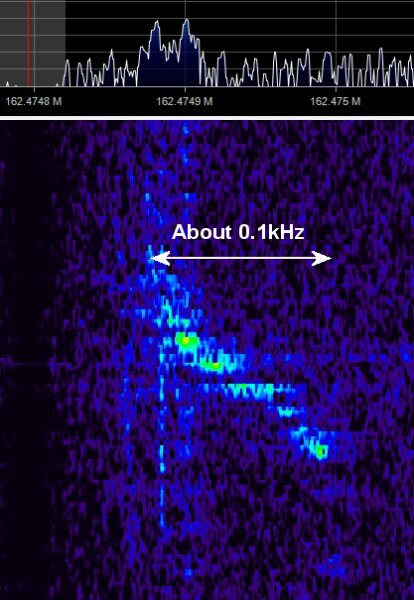 A possible meteor detection in SDR#. We note that if you are interested in detecting aircraft via passive forward scatter and their Doppler patterns, then this previous post on just that may interest you. Over on our forums Andy (M0CYP) has posted about his new meteor scatter detection program which works with HDSDR and any supported SDR like an RTL-SDR. 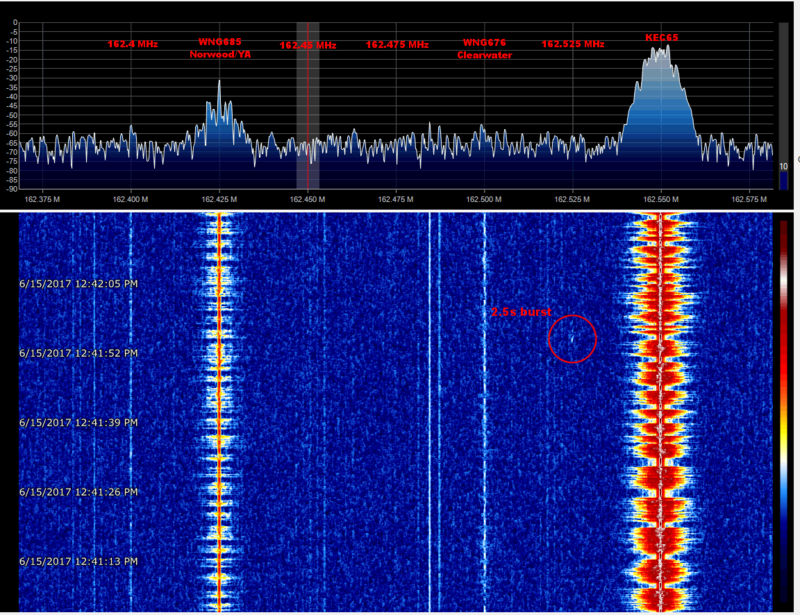 It works in an interesting way, as instead of analyzing sound files for blips of meteor scatter activity it analyzes screenshots of the HDSDR waterfall. The software automatically grabs the screenshots and determines if a signal is present on any given frequency. You can set a preconfigured detection frequency for a far away transmitter, and if the waterfall shows a reflection it will record that as a meteor. Meteor scatter works by receiving a distant but powerful transmitter via reflections off the trails of ionized air that meteors leave behind when they enter the atmosphere. Normally the transmitter would be too far away to receive, but if its able to bounce off the ionized trail in the sky it can reach far over the horizon to your receiver. Typically powerful broadcast FM radio stations, analog TV, and radar signals at around 140 MHz are used. Some amateur radio enthusiasts also use this phenomena as a long range VHF communications tool with their own transmitted signals. See the website www.livemeteors.com for a livestream of a permanently set up RTL-SDR meteor detector (although that site does not use Andy’s software). Andy writes that his meteor scatter detection software is still in beta so there might be some bugs. You can write feedback on the forum post, in the comments here, or contact Andy directly via the link on his website. Patchvonbraun (aka Marcus Leech) is one of the pioneers in using low cost SDR dongles for amateur radio astronomy experiments. In the past he’s shown us how to receive things like the hydrogen line, detect meteors and observe solar transits using an RTL-SDR. He’s also given a good overview and introduction to amateur radio astronomy in this slide show. Now Marcus and others are starting up a new project called the “Canadian Centre for Experimental Radio Astronomy (CCERA)”. They write that this will be an amateur radio astronomy research facility that will produce open source software and hardware designs for small scale amateur radio astronomers. 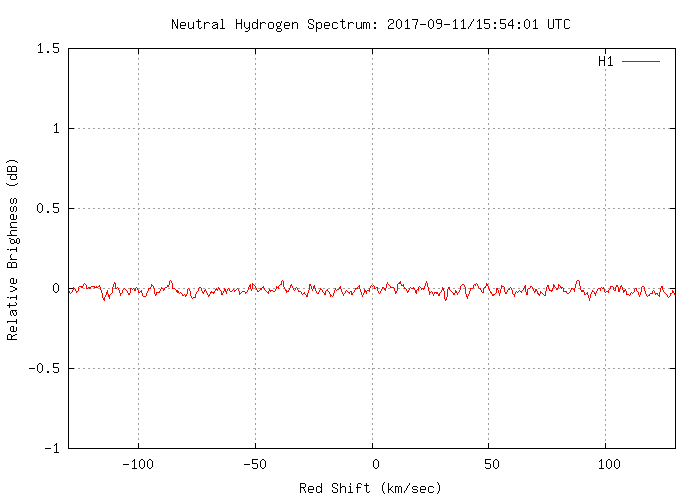 Currently they also already have a hydrogen line telescope set up, which is producing live graphs and data. From their recent posts it also looks like they’re working on building antennas for pulsar detection. They also have a GitHub available for any software they produce at https://github.com/ccera-astro. Radio astronomy is one of the most important ways to observe the cosmos. It is how we learned about the existence of the afterglow of the big bang (the cosmic microwave background), it is how we observe huge swaths of the universe that are otherwise obscured by dust. Most of what’s going on out there can’t be seen with visible light. Astronomy has traditionally been one of the areas in science where dedicated non-professionals have continued to make an enormous contribution to the field. Optical astronomy requires little more than a telescope and knowledge. Radio astronomy has, up until recently, required a lot more skill and resources. However, technology has advanced enough that small groups could be making serious contributions to radio astronomy. With the right sorts of software and information, many dedicated non-professionals could be doing good work in the area, and CCERA intends to help make that a reality. CCERA will also be operating its own radio astronomy facilities, initially in Ontario, Canada. These will serve as a test-bed for our own designs, as a place for us to train interested people in the operation of low cost radio astronomy equipment, and will also be used for real radio astronomy work. All our data will be publically-available. Roughly 10 years ago, I and a number of others started a project to restore a large, historic, satellite earth station antenna at Shirleys Bay in Ottawa. Our goal was to bring the dish back on-line for use in amateur radio astronomy, research, and importantly, educational outreach about science, and radio astronomy. The project came to a sudden end back in 2013/14 when the owner of the dish (The Canadian Space Agency) needed to dismantle it to make way for other occupants of the site. However, during that period, we became fascinated with the possibilities that opening up radio astronomy to skilled non-professionals could bring. 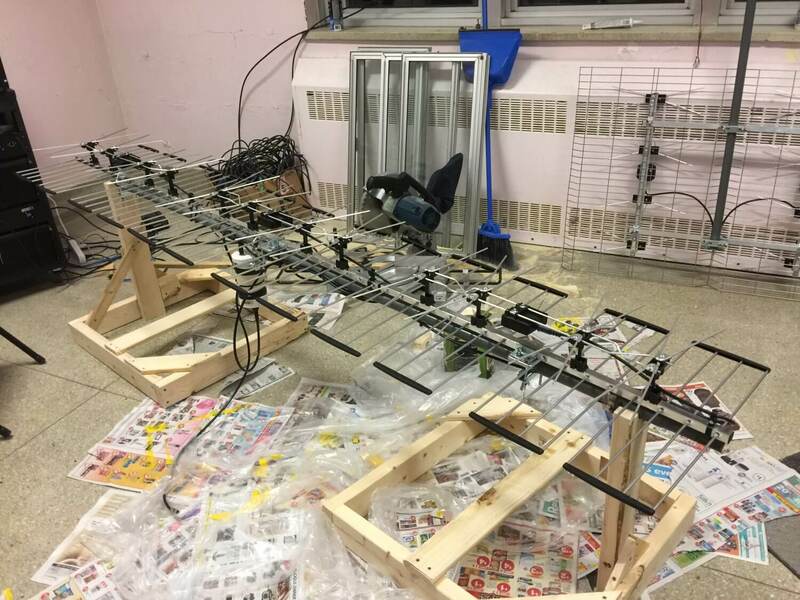 Since then, our group has been working on another far lower cost project to build our own a specialized radio telescope somewhere in the Rideau Valley area. Many of our group live in the area, and Marcus lives in Smiths Falls. With good attention to the usability of our designs and open publication of our tools under appropriate open source licenses, our work should be replicable by others. We thus hope to kick off a new era in non-professional radio astronomy. We’ve secured a small office in the Gallipeau Center outside of Smiths Falls, and will be able to erect our specialized antenna arrays over the coming year. While we have a lot of the equipment we’ll need, we’ll have more equipment to buy, and on-going expenses to cover, including rent, insurance, miscellaneous mechanical construction materials (lumber, metal, etc). We also need to cover expenses relating to incorporation as a not-for-profit. Our goal is to provide a test facility for small-scale radio astronomy research, and to develop techniques that allow small organizations and educational institutions to run their own small-scale radio astronomy observing programs. If we are successful, in addition to making our designs and software available under open source licenses, we’ll be holding regular public lectures, host training seminars, host school groups, etc. We will also produce videos of our work for those who cannot visit us directly in Ottawa. We want to make some of the techniques of “big science” accessible and understandable. We can’t do it without the help of the public, who, we hope, will become our students, collaborators, and ongoing supporters. We will also make all of our data available to the public without fee or restrictions. We believe in openness in scientific endeavours, even small ones such as ours. If you have even a passing interest in radio astronomy please consider donating, as CCERA’s work may open up exciting new possibilities for amateur radio astronomers with low cost SDR dongles. The pulsar antenna being built at CCERA. The annual Perseids meteor shower is peaking right now (this Wednesday and Thursday), and with the right equipment (and location) you can detect these meteors with an RTL-SDR dongle and appropriate antenna. When a meteor enters the atmosphere it leaves behind a brief trail of ionized air which is highly reflective to RF signals. These trails can reflect carrier waves from distant transmitters towards your antenna, allowing you to detect a meteor entering the atmosphere. This is called meteor scatter. If you live in Europe, you can use the powerful Graves radar at 143.050 MHz as the transmitter. In other locations and the USA you can also use analogue TV broadcasts like in this post where the observer uses a TV tower in Canada. For Graves all you’ll need is a dipole antenna and perhaps LNA, but for TV transmissions you may need a directional Yagi antenna. More information can be found in our previous posts about meteor scatter and is this document. But for now if you just want to observe others then currently there is this temporary live stream (now offline) shown below from Poland on YouTube and this always running live stream from the USA. 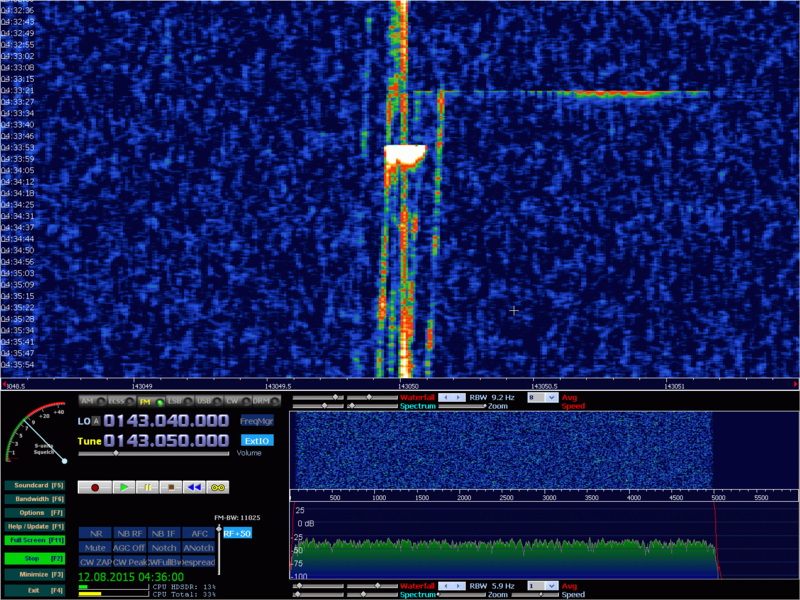 Equipment used by Reddit user Maxworm to detect Perseids meteors using the Graves radar: Dipole, LNA, Bias-Tee and RTL-SDR.